On the pages featuring the Super Jumbo 200, Gibson’s 1940 catalog trumpeted, “This king of the flat-top guitars was especially created for professional entertainers who want an instrument adaptable to any harmony requirement with a beauty and distinction that projects itself to an audience.” Beauty and distinction indeed! Rosalie Allen courtesy of Douglas Green Collection. It really was an impressive instrument – 167⁄8" wide with thick binding, floral-engraved pickguard, striking “crest” fingerboard inlays, gold-plated tuners, mustache bridge, and back and sides made of rosewood – truly built for professionals. The model’s creation was inspired by a conversation between RKO singing cowboy Ray Whitley and Gibson’s Guy Hart at a rodeo in 1937. Whitley suggested Gibson one-up Martin’s increasingly popular dreadnoughts with something bigger and more visually arresting. Hart then asked the company to build a prototype using design cues (neck, pickguard, fingerboard) borrowed from the archtop L-5 and delivered the new “Deluxe Jumbo” to Whitley, who was close friends with Gene Autry (Whitley wrote Autry’s theme song, “Back In The Saddle Again”). Before long, Autry had his own 12- fret version with a galloping-horse inlay on the peghead, his name in script on the fingerboard, and checkered binding around the top. Other singing cowboys placed orders, as well, including Tex Ritter (who ultimately had three including a blond 12-fret), and Jimmy Wakely. Action star Ray “Crash” Corrigan was also among the first recipients as the guitar – by then renamed the Super Jumbo 200 – became a status symbol. Interestingly, for all its promotion and iconic history, the SJ-200 was not commercially successful. Its price – a whopping $200 (same as a Martin D-45) – was a great deal of money at the tail end of the Depression, which is likely why Gibson ledgers show it was produced in very small batches – five or 10 at a time – and it appears that only about 100 were made in total, including the Deluxe Jumbo prototypes. Exact numbers are difficult to determine because the books also show some were shipped more than once, the result of having been taken as a salesman’s sample or (especially during the Great Depression) because they were returned by dealers after going unsold, then sent to other stores. The earliest SJ-200s had a 26″ scale – longest of any production Gibson six-string designed for standard tuning – but that spec was short-lived before moving to 25½" for most of its pre-war run. Before 1940, it had an open-end/mustache-shaped bridge with threaded bone saddles; after, it had an open-end mustache bridge with a traditional flat-top saddle. In fact, overall specifications on the Deluxe Jumbo and Super Jumbo 200 were evolving at such a pace the model was, in many ways, a work in progress. While Gibson utilized well-developed jigs and patterns in the production of standard models, the Deluxe Jumbo and early SJ-200 had a great deal more hand work and “judgement calls,” sometimes resulting in production glitches. Factory ledgers indicate a significant percentage were returned for warranty work prior to the end of World War II. Though there is no clear record of the wood’s origin, it appears that by the mid 1930s, Gibson had moved away from using Brazilian rosewood (Dalbergia nigra) for its backs and sides (as on early-’30s Nick Lucas and L-2 models) to using Indian rosewood for the Advanced Jumbo and SJ-200. It did, however, continue to use Brazilian for bridges and fingerboards – a practice that continued through the mid ’60s. Martin didn’t switch to Indian rosewood for its bodies until late ’69. The final SJ-200 left the factory on August 24, 1943. In ’48, Gibson reintroduced it (with maple back and sides, rosewood fingerboard and bridge) as the J-200, though labels in the guitar continued to be inscribed “SJ-200” until circa 1954. Though similar in appearance and appointments, it was a significantly different instrument. 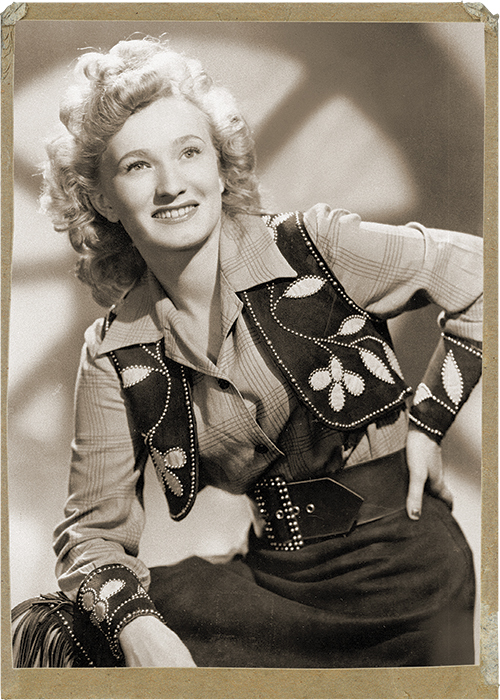 One star who played the SJ-200 was Rosalie Allen, “Queen of the Yodelers.” Born Julia Marlene Bedra in 1924, she was the daughter of a Polish-immigrant chiropractor in Pennsylvania, and at the age of 22 had a hit with a yodeling remake of Patsy Montana’s “I Want To Be A Cowboy’s Sweetheart.” She continued to record for RCA, including memorable songs with fellow yodeler Elton Britt; their (non-yodeling) version of “Beyond The Sunset” was a top 10 hit in 1950. Allen moved to New York in 1943 to join Denver Darling’s radio troupe. The following year, she began a career as a country-music disc jockey on WOV, which lasted until ’56 and ended with the arrival of rock and roll. She was the first woman elected to the Country Music Disc Jockey Hall of Fame, and wrote a column published in several country-music magazines. As her career wound down, Allen moved to rural Alabama, where she raised a family. Her later years were spent with her daughter and son-in-law in the high desert of California, near Palmdale. She passed away in 2003, succumbing to congestive heart failure. Wanting to find a good home for her ’38 SJ-200, Allen’s family reached out to one of her longtime friends, “Ranger Doug” Green, guitarist for the Western bands Riders In The Sky and The Time Jumpers. 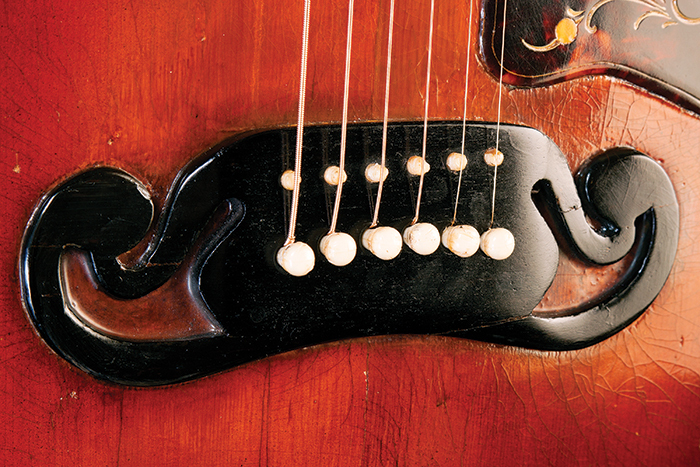 The gracefully hand-shaped bridge on Rosalie’s guitar is an example of the curiosities seen on the earliest Super Jumbo 200s. “Its years in Alabama’s humidity followed by years in the high desert had not done it any good,” he recalled. “The binding was falling off, the neck was separating along the back seam, the bridge was cracked… basically, the poor thing was coming apart.” Finding someone to restore the guitar became a must for Green, but it proved to be a challenge. The restoration took longer than a year, but the result was breathtaking. Today, Green says the guitar plays beautifully and looks like the grand king of the flat-tops it was meant to be. 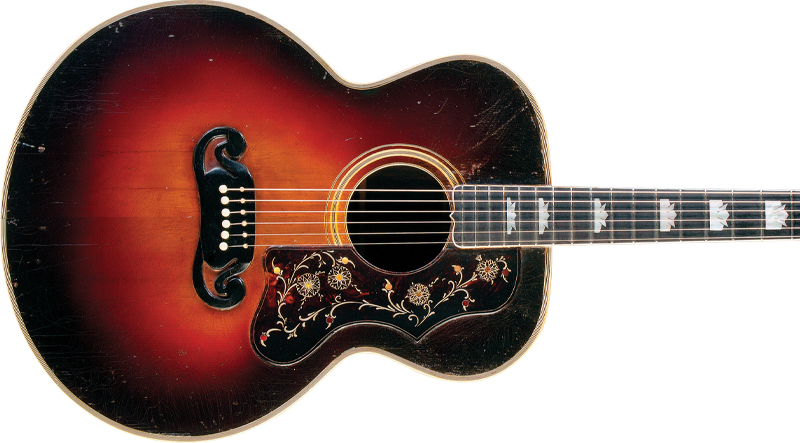 In the hands of Eddy Arnold, Bob Dylan, Emmylou Harris, and others, the post-war SJ-200 and J-200 has served as Gibson’s flagship flat-top, but the pre-war version remains the most iconic – and most collectible.